If you keep wondering how do I get things done and finally overcome procrastination, these 7 steps and one bonus tip will make you victorious. It has been a tough week for me, I’ll be honest. I’m sure I’m not the only person who has had some distractions tie you up and just shut down your productivity. Without getting too much into my personal life, let’s just say that sometimes, life is tough. Dealing with an early medical disability retirement can get your head spinning. Some days, I’ve been going in so many directions. It’s led me to procrastinate pretty much everything in life. That’s been my week in a paragraph. Actually, my last month, to be honest. For the most part, I’ve gotten stuff done. But, my focus has suffered. And, it’s been noticeable. Here’s the real problem of that kind of stress for a guy like me. The more stress I’m under the more I get distracted. Then, the more I get distracted, the more work I put off because of the distraction. Then, I get even more stressed because I’m not being productive. But, I’m sure you don’t struggle with that. What? You mean I’m not the only person fighting procrastination? It’s not just me walking the face of the earth who feels like their productivity level slips from time to time? The ironic thing about all this is in my other job I sometimes teach others how to deal with procrastination. 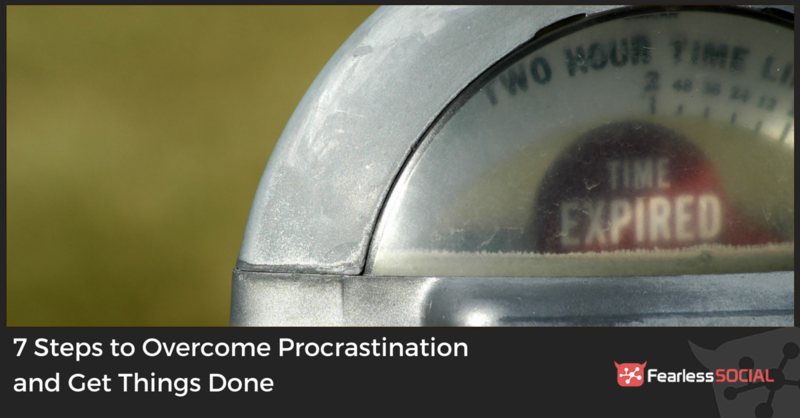 I’ve been a terrific “crash test dummy” to learn ways to help overcome procrastination. So, I had to go back and dust off some basics and re-focus on what the heck I’m doing (and why). 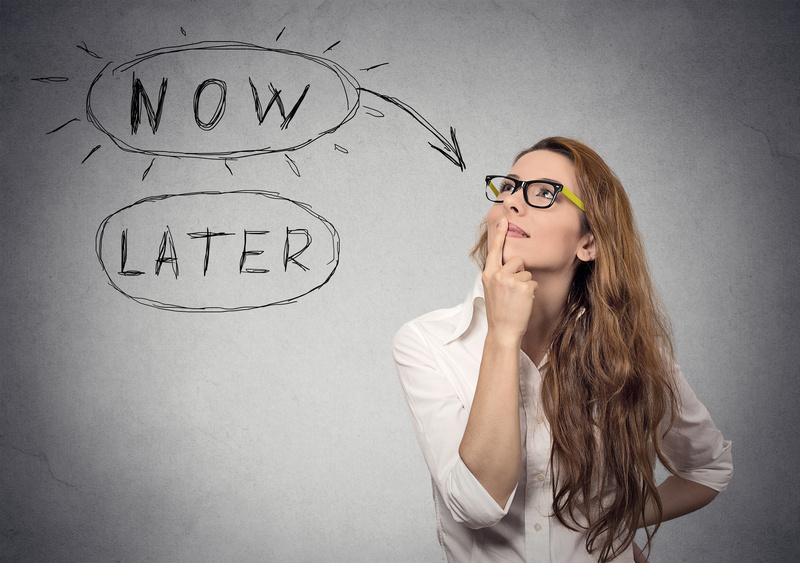 There are lots of great information out there about procrastination. I like one I found in Psychology Today. It helped me recognize the underlying causes for my putting tasks off until the last minute. At the end of this post, I give you one huge bonus tip. This tip will multiply your efforts to overcome procrastination and get things done. When you combine these seven steps with this last tip, you will begin to see unbelievable results. So, let’s get our stuff done! 1. Hit the Ground Running Every Day. One of the hardest things I had to learn to do is to actually get started. You need to be ready to go to work as soon as you arrive, whether you’re headed to work, or working from home. I am a part-time pastor at a small church 30 minutes from home. During that 30-minute drive, I think about what I’ve got to get done. I know what paperwork I need to take care of. I know what people I need to call. And, I know the tasks I need to do. All before I get there. I’m sure many of you who commute to work are the same way. By the time you get to work, you’ve already planned the rest of your day. That is one of the very few advantages of commuting over working at home. These four things are on my list that I take upstairs when I wrap for the day. I look over this list when I’m eating dinner with my wife. I look over it again before I go to bed. And, I look over it a third time while I’m getting ready for the day ahead in the morning. By the time I’ve read over it the third time, I pretty much know how my day will run. When I don’t make that list my next day is horrible.I had a few of those days while finishing up this post. Because other important things for my family have distracted me, I failed to make my list. Because I didn’t have my list, I didn’t have my stuff together for a conference call. Because I didn’t have my stuff together, I disappointed am important client. It was pretty much a disaster. I knew it. They knew it. You would’ve known it if you had listened in. So, hit the ground running means you have to do the work in advance so you’ll be ready to do the work when you get started. Because your schedule is already firm in your mind, you don’t have to go searching for your calendar. You know the things you have to get done and what you need to make progress on. Almost without thinking, you know if you can do something else for someone else. Last week, I had a surprise call from an attorney friend of mine. 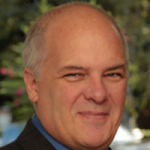 He’s looking to get started writing two books to self-publish. This guy sought me out to consult him and help him with the process. I was excited. I really wanted to do this job. But, because I knew what my schedule was like, I pushed his invitation for a lunch meeting back by two days. We met, discussed the plan, and are moving on with the project. Here’s the benefit of that list in this situation. I was working on a project that I had committed to for a set amount of money. I knew this new project would amount to about 2 times the value of the project I was completing. But, instead of having an upset client, I now have two pleased clients! Let’s look at the other side of anticipation. Last month, my wife had a medical emergency. It wasn’t anything I could plan for. Emergencies are, by definitions, unplanned. I stayed in the hospital with my wife for two whole days. For those two days, I never touched my computer. My list helped me expect the things I needed to take care of the next morning (she was admitted at 4 am). I texted clients. I emailed clients. I contacted clients via Facebook. I knew exactly what to tell each client, and I knew which client I needed to offer a solution to meet their deadline. The final result was that none of my clients were upset because I didn’t hit their deadline exactly. Plus, I was only late, by about 5 hours, on only one assignment. When you have a list, and you know what’s on that list. You can deal with both surprises and emergencies. 3. Develop a Method of Keeping Track of Tasks That Work for You. Syndicate Momentum mastermind leader, Tabitha Thomas offers some great strategies for keeping track. I have tried so many different methods of keeping track. I have discovered that, for me, a hand-written list works. But, that might not be the right solution for you. I’m sure there are several other solutions. If you’ve found one that works for you, make sure you share it in the comments below. That way, we can all benefit from your experiences. My suggestion is to try a few methods until you find one that works for you. There is no “one-size-fits-all” solution. Just use the one that helps you get stuff done. You know it’s going to happen. Your boss, a co-worker, anybody can come up and interrupt your flow. If they hang around and become a complete stoppage, now, you’ve got a disaster looming over you. It’s called a deadline. Be prepared mentally to remove that blockage and cut it’s demands on your time. By rehearsing a line like the one above, you don’t allow yourself to be interrupted. You get more done. And, you train others not to stop your work time. I’m learning this lesson in spades from Dr. Ben! We have a private in-house chat app that we use. Ben and his associates do not just drop things to respond to each other’s needs. They don’t “have a minute” unless they do. This one tip saves me so much time. Just let your email go until you do have a minute. Send phone calls to voice mail until you have a minute. Don’t answer the door until you have a minute. Here’s another tip from an article in Business Insider. 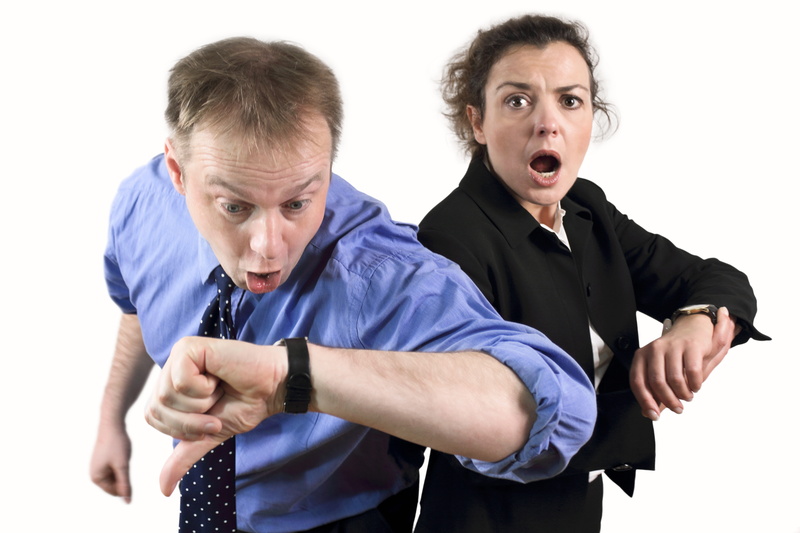 “Don’t accept a meeting unless the person who requested it has put forth a clear agenda…” The article also stipulates that you need to know how much time they say they’ll need, and give them only half. Before long, you’ve gotten so much accomplished that you realize that now you have extra time! Now, you have time for the people who are important in your life, your family. The next step will help you get stuff done after you’ve used this step. Put yourself on a timer. Keep a goal to hold meetings for no more than 30 minutes. In my daily schedule, I try to have four 30 minutes breaks. I’ve found that I can use these breaks for several different purposes. To get away from my desk. If the meeting is one you control, then, have a written agenda. Be prepared to cover your points quickly. Set the timer on the meeting for 30 minutes, and get it done. Yes, there are times when meetings (even ad-hoc ones) can not be avoided. And, yes, there are times when those meetings will be longer than half an hour. But, make that your stated goal, and stick to it as much as possible. 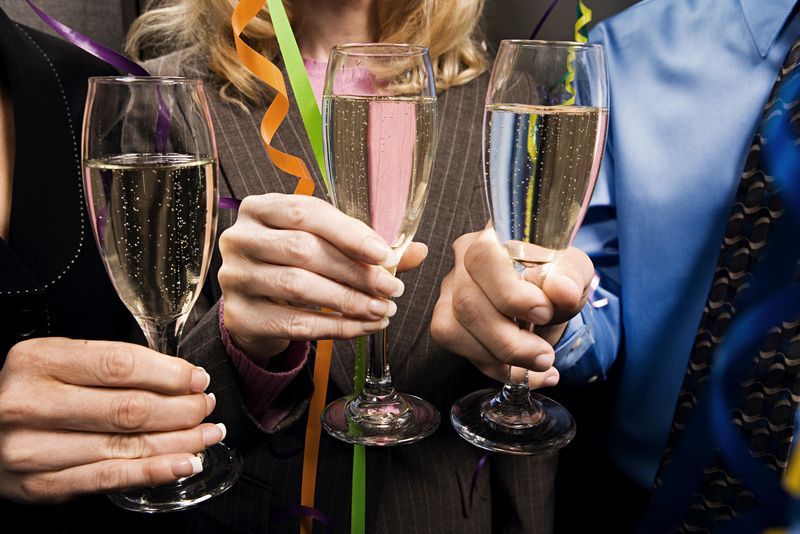 Do you find things to celebrate about your work each day? You should! Maybe you just completed a work project. Celebrate it’s completion and it’s removal from your calendar. A complete project clears time for other work, or a new project. That’s something to celebrate. Want to know a secret of high achievers who get stuff done? Let someone else do the work. Debbie Drum shows you 6 Tasks You Should Outsource Immediately in this post. If you’re a freelancer like me, then, it clears the calendar for more paying work. And, that’s always a good thing, right? There are times that I celebrate finding a great recipe, or an awesome deal. I celebrate the turning of a potential client into a friend. And, of course, I celebrate turning that friend into a long-term business relationship. Returning back to the start of this list, there’s one more thing you need to pay attention to in the morning. Most mornings, I’m slow moving from pillow to floor to shower. Some mornings, its a slow go from shower to breakfast and breakfast to work. To be honest, it takes me about 90 minutes from the time my alarm shakes me out of bed to get going in the office. So, I set my alarm and my calendar accordingly. If you need an hour to awaken and get ready for the day, then get up an hour earlier. When you respect your own needs, you’ll be better prepared to get things accomplished. 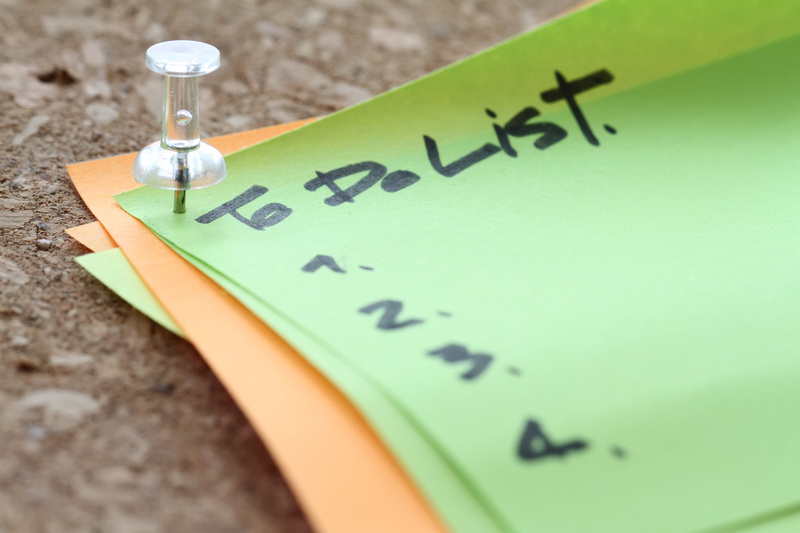 All the things in this list are something you can do to improve your procrastination. Heed the advice: you are the master of your own destiny. But, there’s one missing ingredient in this recipe of procrastination killers. It’s something you can do by yourself. Taking advantage of this tool is one of the smartest things I’ve ever done. It has had the most power of all to help me kick procrastination to the curb. And, when I find myself slipping, it is this tool that gets me back on track. I never realized how being accountable to someone else to get stuff done would help. Today, I’m accountable to nearly one hundred people. And, they’re accountable to me, too. Together, I’ve seen some unbelievable things come out of this group. The power of 100 friends sharing this thing called accountability is huge. Among this group, there are entrepreneurs who have multiplied their business by several factors. There are new entrepreneurs who are totally changing their business models and plans completely. And, the cool thing is, these folks are helping each other overcome their own obstacles along the way. In an accountability group, there is only one way you lose to procrastination. It will destroy you in an accountability group if you don’t invest into it. The successes of the members of an accountability group starts to rub off on you. You become motivated by their wins and you want to share your wins with them. Here’s what some of my accountability group members have to say about the group. But, the story that charges me up and makes me refresh my focus is the story of Sophia and Tony. Two weeks in a row, this couple had huge gains they attribute to being in Momentum. 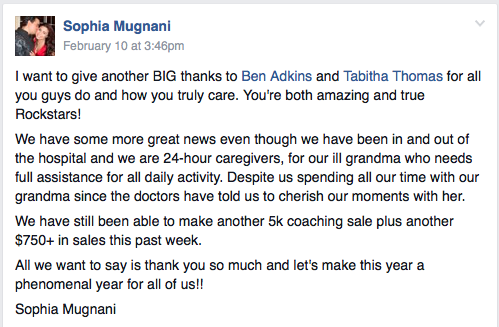 Sophia thanked Ben Adkins and Tabitha Thomas, the mastermind managers. Then, they shared this unbelievable testimony on January 27. That’s just 4 weeks after the group launched. 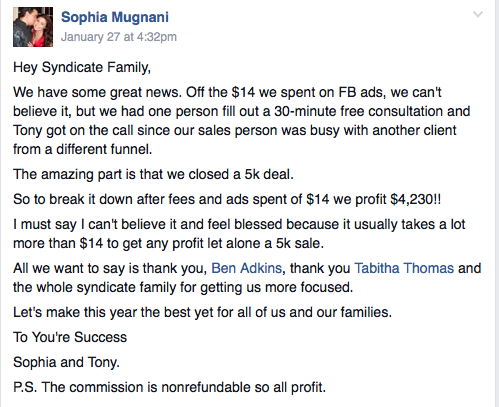 About two weeks later, Sophia posted another similar success story, on February 10. Remember, procrastination is stealing from yourself. The loss of productivity due to delaying will, in the end, only damage you. The strategies that work for you are the ones worth continuing. If you put forth effort to change your lifestyle, you’ll begin accomplishing more. The gift of this approach is the compound effect of each of these changes. But, the last strategy (accountability) is the glue that will hold it all together! 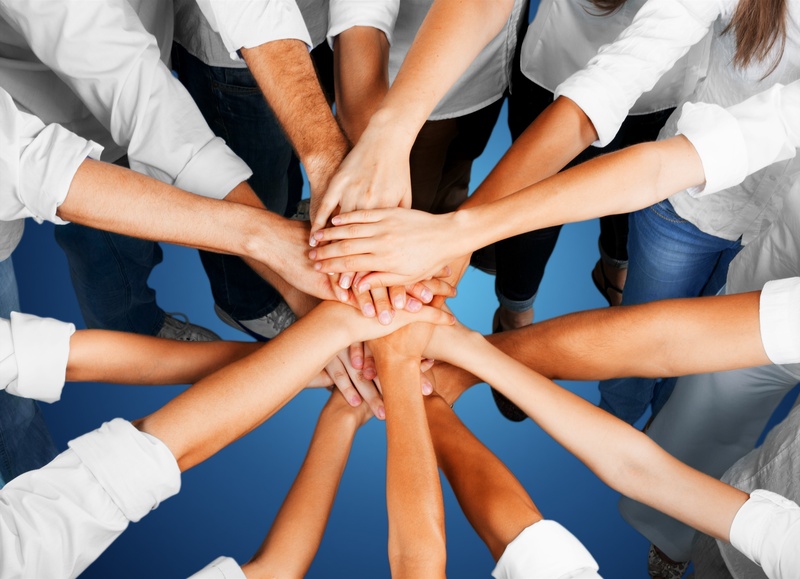 If you don’t qualify for membership in The Syndicate Momentum group, find a group that will work for you. Then, when you are ready to pour some rocket fuel onto your business, join the group. That’s when we’ll get kicked out, and you’ll be left to guide another group behind you!